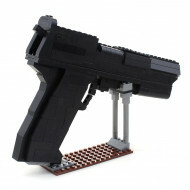 Firearms - This category includes life size guns made from building blocks. 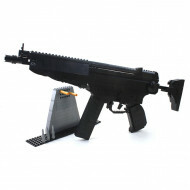 This includes everything from pistols and hand guns to sub machine guns and mounted weapons. This box contains 597 building blocks which can be assembled into a MP5 submachine gun. All of the blocks are included in the box along with an instruction book.. This box contains 508 building blocks which can be assembled into a MP7 submachine gun. 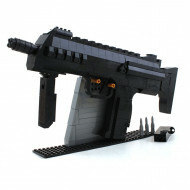 All of the blocks are included in the box along with an instruction book.. 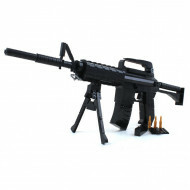 This box contains 524 building blocks which can be assembled into a M16 assault rifle. All of the blocks are included in the box along with an instruction bookl.. This box contains 373 building blocks which can be assembled into a Desert Eagle handgun. All of the blocks are included in the box along with an instruction bo.. 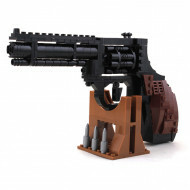 This box contains 300 building blocks which can be assembled into a colt python handgun. All of the blocks are included in the box along with an instruction boo..